When Christians began creating art in about AD 200, Raising of Lazarus scenes still seemed far too pagan. Matisse like art covers catacomb walls with abstract shapes and lines adapting pagan symbols with purposeful variation: Eucharist vines replace acanthus leaves. No crosses yet. After meeting Christ, Christians refrained from creating art for nearly 200 years not just because of the Old Testament commandment against graven images but also because Christians equated making art with paganism. By the first half of the third century, Old Testament stories decorated the walls of catacombs, especially the Jonah story which could be understood as a precursor to Christ’s resurrection. About five hundred later, New Testament scenes including the Raising of Lazarus also appear. The earliest versions followed standardized minimal iconography because even then Christians feared worshipping the image and the revelry of making it. The purpose of these early scenes is only meant to remind believers of Christ’s ministry to encourage prayer and worship. 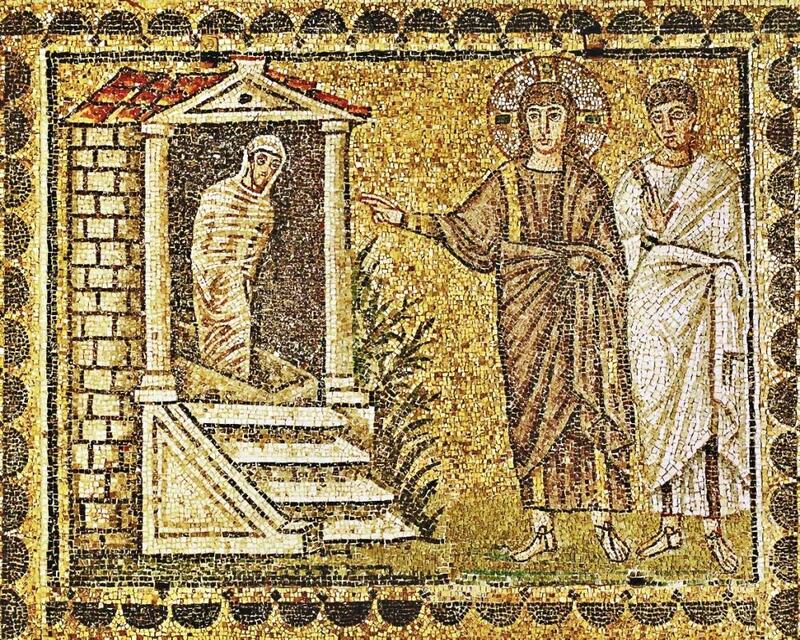 The Raising of Lazarus (see below) depicts a larger than life Christ as young, beardless and like a magician holds a wand as he waves it toward a much smaller entombed and completely mummified Lazarus. The perspective is close up without Mary, Martha or a crowd and the scale accentuates Christ’s divinity. 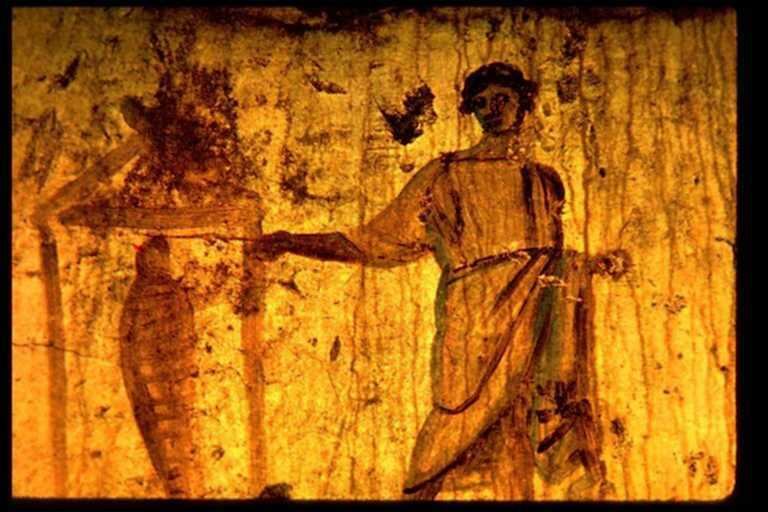 Once Christianity became the official religion of Rome under Constantine ca AD 312, Christian art changed dramatically from depictions on catacomb walls to elaborate government sponsored mosaic programs covering the walls of Basilicas where Christians worshipped in public. 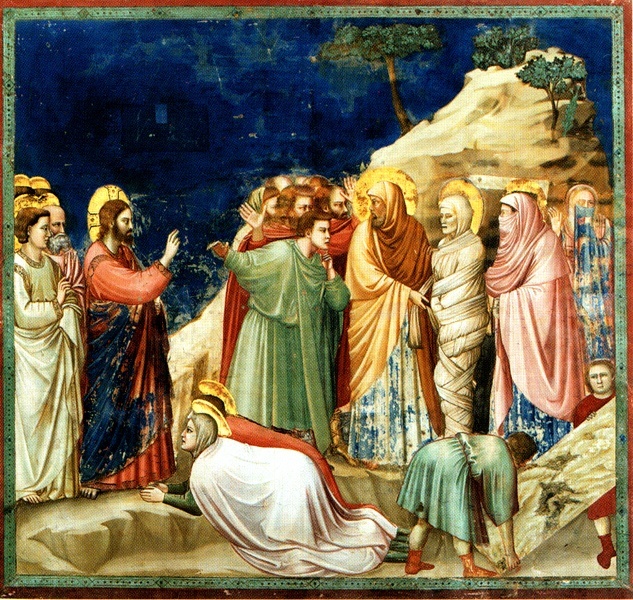 Even in the sixth century, artists depicted the Raising of Lazarus in a similar way: the focus remained on the miracle and relationship between Christ and Lazarus. 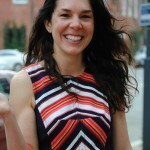 Though now believers lingered over details and studied the relationship between many images as part of a larger program of art just as reading about Christ’s ministry is better understood as a whole. The image below depicts a sixth century mosaic from the Basilica Sant’ Apollinaire Nuovo in Ravenna. The gold background represents the eternal, heavenly space so like God eternal, the image transcends time and reminds the viewer that this NT scene prefigures Christ’s resurrection and our own resurrection. Lazarus’ face is visible unlike earlier versions in catacombs. 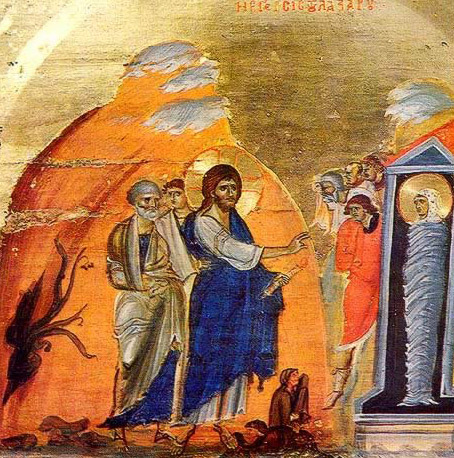 By the twelfth century, iconography for Raising of Lazarus has changed as seen in the icon (image below) from St. Catherine’s Monastery in Sinai. Now a throng of people fill the space as well. Among the crowd Martha and Mary stand or kneel in prayer while individuals cover their noses disgusted by Lazarus’ pungent death smell. These icons much like the earlier mosaics encourage the viewer to study the image and experience the story as a participant in the crowd. The gold background represents heavenly space and time eternal. Even throughout the Renaissance, the iconography changed very little; though artists became increasingly interested in depicting three dimensional space and human emotion. Giotto’s fresco (shown below) from 1305, uniquely shows a disciple, most likely Peter, because of the halo and short cropped beard or Thomas who is specifically mentioned in this Biblical passage touches Lazarus. On Lazarus’ right, two women cover their noses disgusted while Martha and Mary kneel at Christ’s feet. Overall, Giotto conveys stoicism through calm and controlled brushwork. 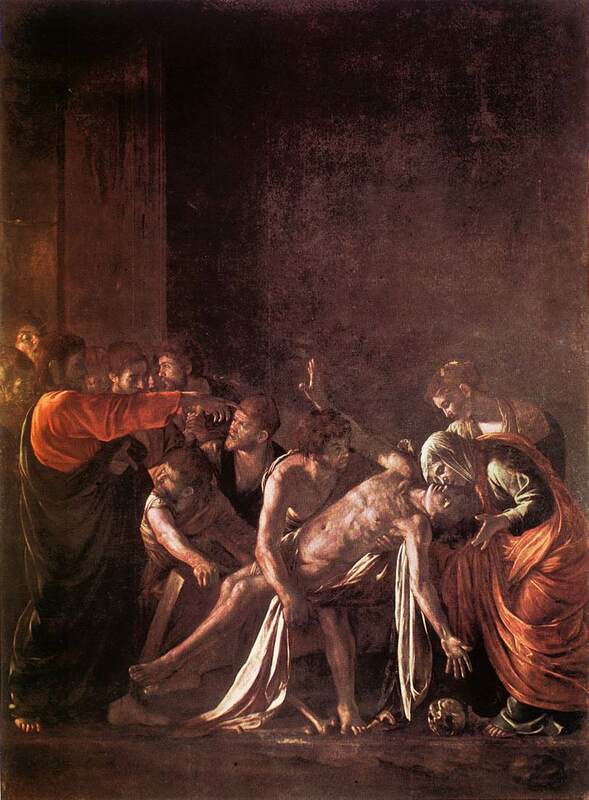 In 1609, Caravaggio broke from tradition, heightening the drama by painting Lazarus still dead and almost naked in the center foreground of this oil painting. Martha holds her brother’s head while a man steadies his torso; thus, Caravaggio, followed Pieta iconography instead of Lazarus iconography viewing Lazarus’ Resurrection as a precursor to Christ’s death and ultimate Resurrection. 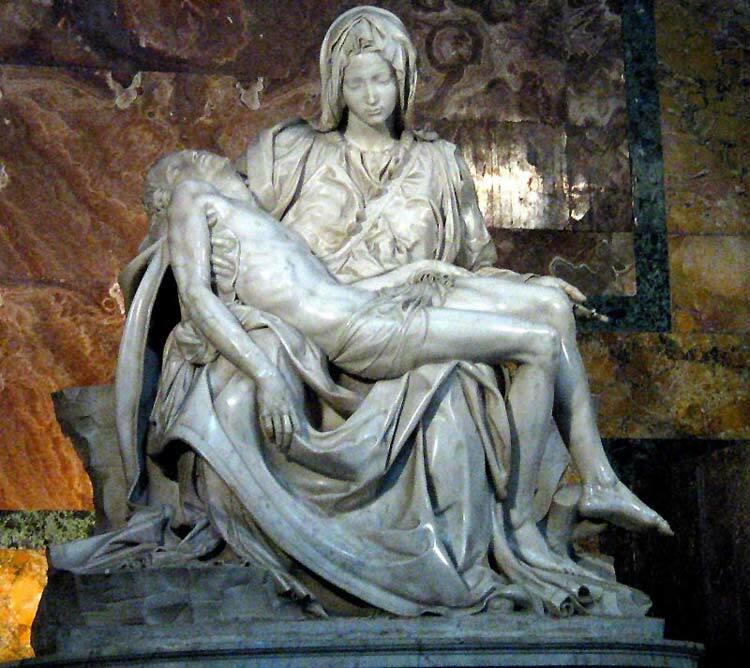 The Pieta or the pity depicts the deposition from the cross and Mary holding Christ. The stark contrast of light and dark only further dramatizes an already charged emotional scene. 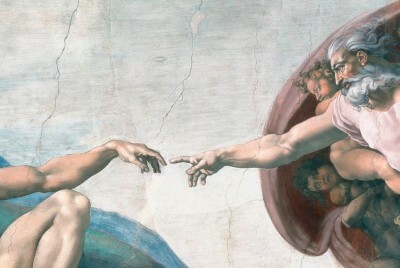 Caravaggio also identifies Christ as the Second Adam by borrowing from familiar iconography; Christ extends his arm in the same manner as Adam extends his arm toward God in Michelangelo’s Sistine Ceiling. 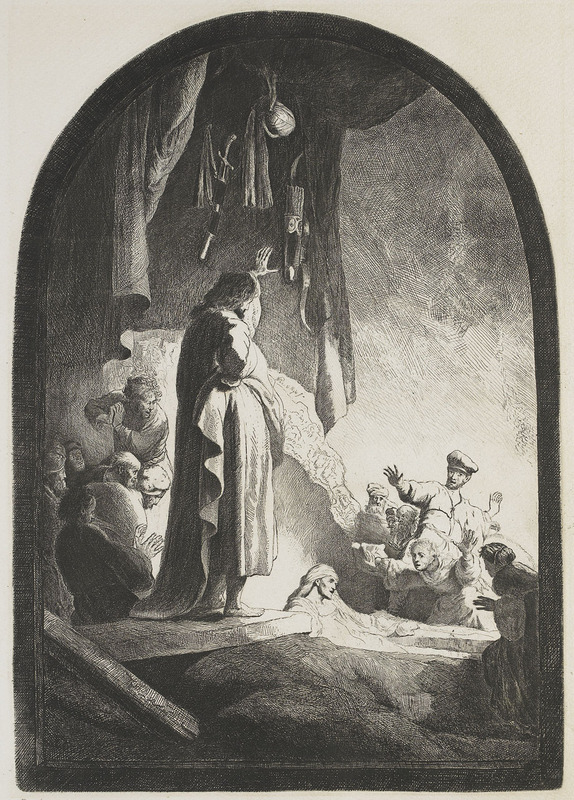 Art contemporary to Caravaggio’s includes this Rembrandt etching in which the dramatic use of light and dark is rendered again. Rembrandt’s composition and figural poses became the inspiration for another great Dutch master, Vincent Van Gogh who in 1890 painted a colorful version. 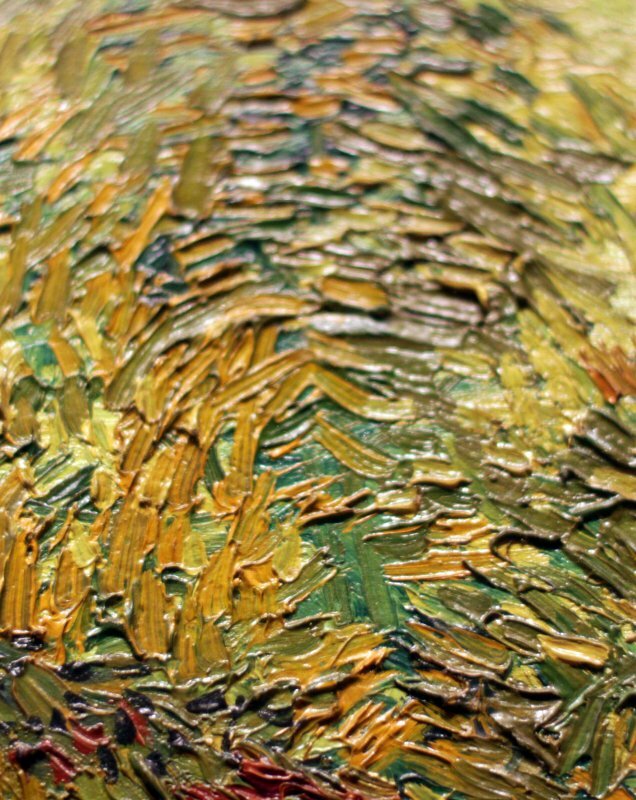 Van Gogh layered paint so thickly that it resembled carvings for a woodcut and has a three-dimensional sculptural quality. Though he used Rembrandt’s work as inspiration, Van Gogh painted it uniquely his own. Unlike Rembrandt’s Van Gogh’s is a close-up view cropping out Jesus and the crowd to focus our attention on Lazarus, Martha and Mary who rests at Lazarus’ feet. Christ appears absent; though God’s presence is symbolized through the sun. 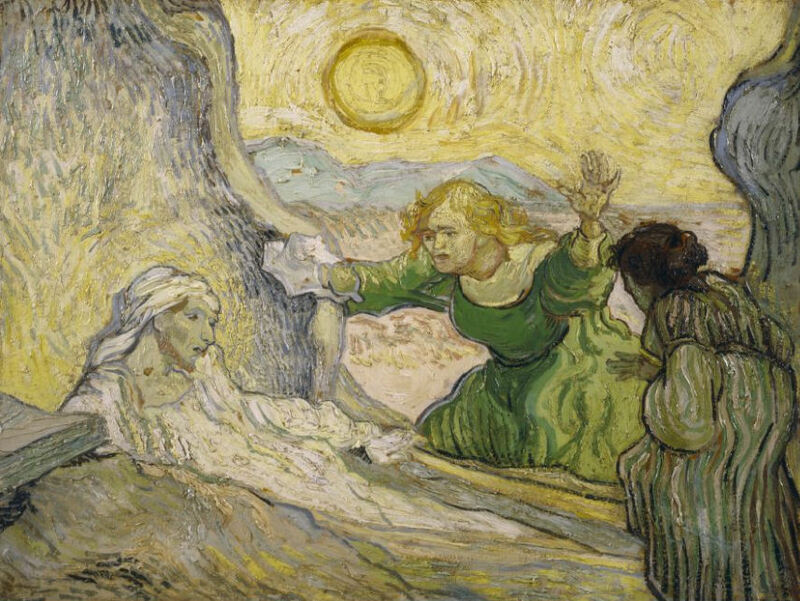 Van Gogh, the son of a preacher who spent time as a pastor, may have identified with Lazarus’ resurrection as a parallel to his own salvation while convalescing at the mental asylum in St. Remy after the famous incident when Van Gogh cut off part of his ear. This story like a microcosm of life shows how we anticipate Christ’s return, how we question death and tragedy like Mary and Martha. Christ had a greater plan and made his plan known the day he returned. Christ returned; he did not abandon. Christ said “I am the resurrection and the life.” Then Christ resurrected Lazarus. Christ does not only say these powerful words, he proves them and He will again. Bravo Jason! Excellent Tour de Lazarus. Please continue your ministry.